Meet Sir Walter Wally the groundhog and get his prognostication for the next six weeks! The Shadow Ceremony is at Noon on the Bicentennial Plaza, right in front of the Museum! Ever wondered how Groundhog Day came to be? 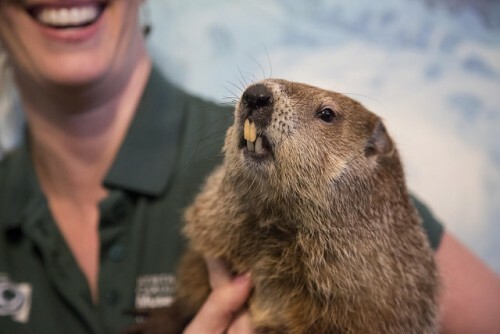 You’ll learn about the history of Groundhog Day, and get to meet one of the original animals that was used to predict an early (or late) Spring. These groundhogs think there are 6 more weeks of winter headed their way. Help them get back in their hole! Groundhogs burrow into the earth to create their home. Learn about other animals who build their homes. Groundhogs hibernate for winter, but what about the other animals we are used to seeing? Reptiles depend on their environment to stay warm, so what do they do when it gets cold? Ready for warmer weather? Find out what signs nature provides when spring is on its way! Get ready for the shadow ceremony by making your own Groundhog Headbands! See Sir Walter Wally up close and personal and learn about the importance of wildlife sanctuaries.